It may not be autumn any longer (the 4 inches of snow we got last night made this very clear), but that does not mean that baking with pumpkin is over. I am a fan of baking with pumpkin all year long. It's such a good way to add healthy moisture to baked goods. These healthy pumpkin scones are not a traditional scone, but that was the best way I could think of to describe them. Definitely not a "true scone", but close, and a lot healthier then a real scone - I really liked them a lot! There are made with a majority of oat flour, and a little olive oil for fat and moisture. The rest of the moisture comes from the pumpkin. Sweetened with a mix of brown sugar, maple syrup, and molasses, and flavored with cinnamon and vanilla, yum. Preheat the oven to 375 degrees. In a large bowl, combine the oat flour, all purpose flour, sugar, baking powder, salt, and cinnamon. In a smaller bowl, whisk the vanilla, pumpkin, egg, maple syrup, molasses and olive oil. Add the wet ingredients to the larger bowl with the dry ingredients - stir until just combined. Add the chocolate and walnuts and stir just a few times to distribute them throughout the batter. Drop the batter onto a baking sheet lined with parchment paper using a round cookie scoop. Sprinkle the tops with a little turbinado sugar and bake for 12-15 minutes until baked through. Cool slightly before eating, or let cool to room temperature. Cake for breakfast? Always a good idea in my book. While this recipe is not a cake in the traditional sense, light, airy and super rich, it kind of has an indulgent feel when topped with a yummy yogurt almond frosting. It's not a very sweet cake - dense and hearty in texture, yet still super moist thanks to the applesauce. The buckwheat flour really adds a unique dimension in both flavor and texture. There is a lovely bitterness to this cake from this flour which I love, but might take a little getting used to. 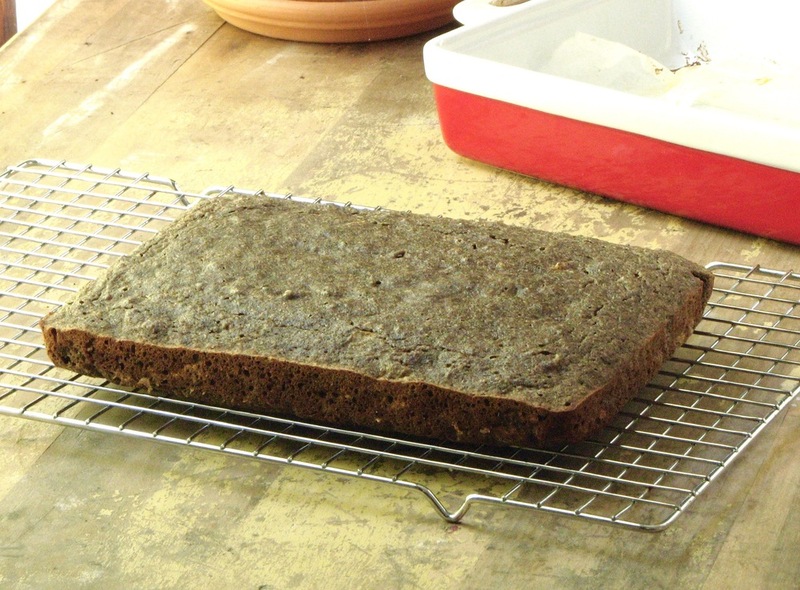 And because buckwheat is not "wheat", it behaves differently in baking. It results in a cake that is almost a little sandy in texture, and more dense than a traditional baked good. I adapted the recipe (because I just can't help myself!). The original used almond flour in addition to the buckwheat, and coconut oil. I replace these with whole wheat flour and butter instead. This likely altered the texture somewhat but in the end I loved the results, so it doesn't really matter! I also used some liquid whey (leftover from homemade yogurt) instead of almond milk, but I'm sure buttermilk would also work Finally, I adjusted the spices somewhat based on my preferences, and the time of year and replaced the molasses with maple syrup along the same vein. Overall, this dense, somewhat bitter but very interesting "cake", topped with a healthy yogurt and almond butter frosting ticks all the right buttons for me. The most important thing being that it's delicious. In the end that's all that really matters! Preheat your oven to 350* F and line a 9x9 pan with parchment, or grease thoroughly. Stir the buckwheat flour, whole wheat flour, sugar, cinnamon, cardamom, baking powder, and salt in a large bowl until well mixed. In another bowl whisk the eggs together. Then whisk in the milk, applesauce, vanilla, butter and maple syrup until fully combined. Pour the wet ingredients into the dry ingredients and stir until just combined. Pour the batter into your pan and spread evenly. Bake for 38-40 minutes, testing with a toothpick for doneness. You want the toothpick to be slightly sticky, not gooey or dry. Allow to cool for 10-15 minutes before slicing. Serve with a dusting of powdered sugar, or with almond butter frosting (recipe below). Mix together the almond butter and Greek yogurt until well combined and smooth. Add in the maple syrup, cinnamon and salt and stir to combine. Taste and adjust flavorings if desired, adding a little more almond butter if it is too tangy, a little more yogurt if it is too thick, or a little extra maple syrup if you want it a little sweeter. Spoon frosting onto each slice of cake, or spread in an even layer over the top of each piece. There are times when my fridge and freezer are full of odds and ends, little bits of leftovers from various meals that have been hanging around a week or two. There are a couple ways to go at this point, pasta is always a good way to "clean the fridge," but recently I've been going another of my favorite routes, eggs! I've done frittatas, omelettes, and scrambles, but most recently I also needed to use up a couple of weeks worth of bread ends that have been floating around the freezer. Strata - here I come! Strata's are great; a full meal all in one pan. And you can basically put whatever ingredients you want in them. All you need are some bread cubes and eggs, then let your imagination go wild! I really enjoyed the sun-dried tomatoes and ricotta in this version. The creamy ricotta and the sweet tomatoes are a lovely combination, I added in some finely chopped leftover kale and called it good! This is a perfect lunch to make ahead and eat all week. Super easy to grab and go in the morning. You can eat it for breakfast or lunch, or even dinner. Super versatile, healthy and delicious! Crack eggs into a large bowl. Add the milk, salt and pepper. Whisk until well combined. Line a 9x9 inch baking dish with parchment paper and spray with cooking spray. Spread the bread, tomatoes, and kale evenly in the baking dish. Pour the egg mixture evenly over the bread cubes. Press the bread down into the eggs to ensure it is all moistened with the egg. Spoon dollops of the ricotta evenly over the whole dish. Place in preheated oven and bake at 375 for 30-35 minutes. Let set for 5-10 minutes before slicing to enjoy hot, or let the dish cool to warm or even room temperature before digging in. You can also let cool and place in the fridge. If you choose to refrigerate, let come back up to room temperature for 20-30 minutes before eating. We're halfway into October now, which means that for several weeks now, every food blog has been posting pumpkin recipes ad nauseam. Well, I don't want to miss out on all of the fun, so I thought I'd share these pumpkin oat breakfast bars today. I made this recipe twice in the couple of weeks and have been eating them for breakfast pretty much every day. I've been doing a pediatric rotation this month, and have to be at the hospital at 6:30 every day. I haven't been getting up early enough to eat breakfast at home before I head to work so these bars have been the perfect thing to throw into my lunch bag each morning. Then, whenever I get a few minutes (more like 30 seconds) to scarf something down, I can enjoy a little treat for a (very) quick breakfast. The recipe is simple, and not fancy at all. Oats, pumpkin, a little sweetener and some spices. That's the bulk of it. Plenty of room to switch things up as you see fit. Add more chocolate, add less; try some dried fruit and/or your favorite nut instead. Swap out the spices if you don't care for all those warm fall flavors. Whatever you decide, you should end up with a hearty breakfast bar, sturdy enough to carry in your purse and eat out of hand whenever you have a chance. If you have a few extra minutes, do what I've been doing, and top the bar with a little bit of almond or peanut butter for a little extra protein boost. This is my favorite way to enjoy these bars. I hope you enjoy them too!